Garlic and shallots late December. 11/21 – Garlic and Shallots have emerged and looking happy in wheat straw mulch. 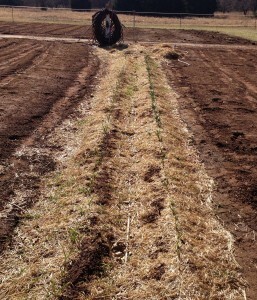 Except these onions and perennials, the rest is tilled and irrigation hoses coiled up. Still have Cilantro. Deer are in rut and keeping out of the garden, but mangling peach trees in orchard with new antlers. Saw two nice bucks last week. Neighbor has loosed Bobwhite quail and is feeding them. 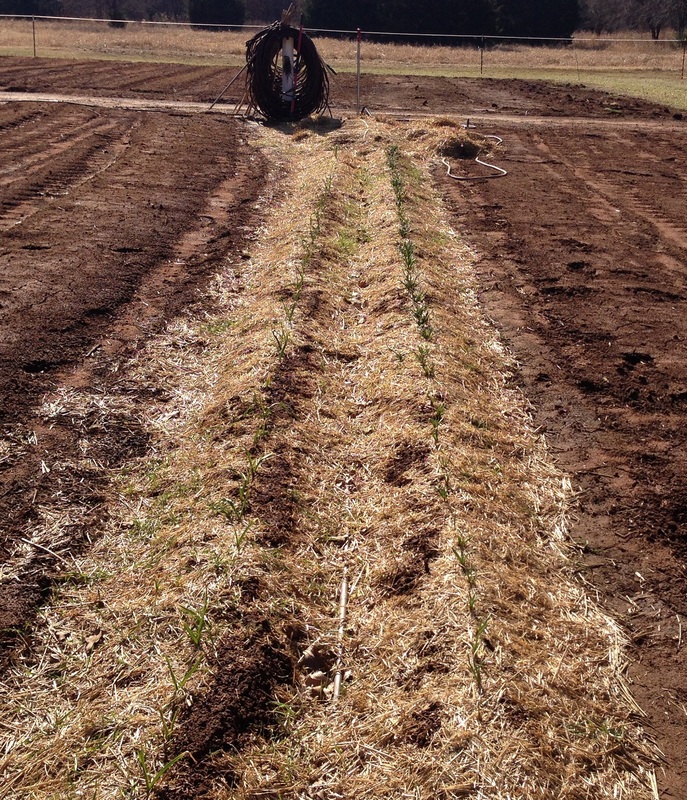 10/9 – Getting beds ready for Garlic, Shallots and a seed bed for onions. Still getting green beans and okra. Herbs – shipped big box of Cilantro, Chive, Sage and Rosemary. Spread compost in onion patch. Test soil and amend onion patch. Fencing – deer are getting in again. Bait with peanut butter again. Last treatment only lasted 3 weeks. 9/14 The melon patch is pulled up and in the compost. Getting 2 small boxes of beans per picking. Cucumbers have a white mildew or fungus. Treating them. 9/4 The fall pole beans and cucumbers are producing. The cucumbers are 1 foot or longer. Okra – picking daily. Late crop producing as first crop wanes. Tomato – pruned heavily last month. Getting 2 box a week. Peppers – Picked 4 times. Planning 2014 garden layout and varieties. Buy garlic bulbs and onion seeds. Maybe more shallots and leek seed? Prep onion and garlic beds. Build seed starting enclosure in barn Awaiting shelving. Will introduce them to first crops. These people live in the now. They need not be bothered with ‘futures’. buy seed starting supplies (pots, markers, soil) need 4″ pots in Feb.
Ouch! March will be a very busy month. Lots of seed starting and planting. Including planting some very early tomatoes which will be at risk from frost. Last year’s last frost was early March. Beds and trellis materials on site. The garden is really taking shape. Garlic is 18 inches tall, strawberries are blooming and setting fruit. Asparagus and potatoes are emerging. The rye grass clover field that surrounds the garden looks fair. Maybe will add another grass to the mix. Wet and cold weather are delaying planting. Peas (and same used later for Beans and Cucumber) Looks good. Tomato (build spiral stakes with heavy wire and support with T-posts) Nice work Adrian! Turn both compost piles into one. Start new pile. Cultivating the garden will be the biggest chore. Pulling weeds, tilling, mulching, pruning, pest management. Peas – picking fourth time today! Cabbage – follow with clover – 6/6 need one more week – must pick before heat comes. Side dress corn with nitrogen – volunteers weed, feed and hill the corn! 6/28/13: Just shipped 9 boxes to Other Options! Bobby picked it up. Yeah! Squash, and the last of the onion, peas and garlic. 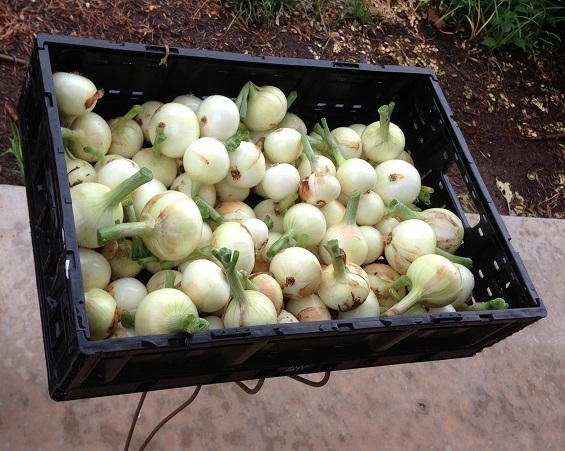 6/15/13: Garlic and onion harvest looks very nice. Harvested 18 heads of Rubicon cabbage. It needs a home or refrigeration. The heads are about 3-4 pounds each. With the late planting several crops will not be ready this month. Tomatoes, Okra, and peppers are behind schedule. Heavy rain (15 inches last 30 days) has disrupted volunteer activities and is making cultivation difficult. Squash and Okra both should be re-planted. Peas – followed with Beans and Cucumber – got 70-80 pounds of peas. Squash – getting a few squash. High wind and standing water killed all but 4 vines. – follow with squash (More yellow summer squash and winter acorn squash). Garlic – follow with cilantro – got excellent garlic harvest of 70 heads of softneck. Will get another 20 heads of stiffneck which is ready now 6/15. 7/7 – Cut some Okra yesterday – the first pods were ripe. It will need picking every other day. Melons, corn and potatoes look really fine. 7/23 – The corn harvest was really nice. We got 225 ears that shipped. They are very tasty (chickens are eating the sub-par ears). Got 5 Burpee PMT cantaloupes today! there are 30 or so in the field + 30 Heart of Gold and 10 Crimson Sweet watermelons. Yeah! First pepper harvest is tomorrow. All varieties are productive. We will make our biggest shipments this week!!! 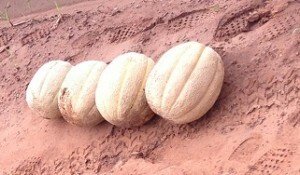 7/26 – Just after our largest shipment ever yesterday, today we picked 20 more melons. You must tight-rope walk in the patch to avoid stepping on melons. The Heart of Gold cantaloupe is 1/3 the size of the Burpee PMT but deliciously sweet. Picking watermelon too. Tomatoes – finally! Getting lots of Juliet and Big Beef. Brandywine is sluggish. Peppers – nice first picking of 4 full boxes – they loved compost mulch – grade A+ quality! Okra – slow start, but growing fast. Cantaloupe – counted 30 PMTs and 30 Heart of Gold and more coming. One PMT vine has 7 melons! The newest pile is very hot. Turn it in August. Did some earth work to divert upper pasture run-off away from the garden. 8/29 – Picked 5 boxes of peppers! Cucumbers and pole beans are coming. Original Okra is peaking as second crop begins blooming and producing. The melons continue to amaze me. Picking 5 to 10 a day. Second squash planting is fading (ate up with squash bugs). 8/21 – Fall cucumbers are setting fruit and climbing the trellis. Picked 3 boxes of peppers, 2 box bell peppers and balance Jalapenos, Pablano and a few Serrano. Okra is picked very day. Getting 5 melon per day. 8/17 – Fall beans, squash and okra are nearing production. The beans and okra are blooming and the squash is producing nice daily harvest. Getting 1/2 basket of tomatoes per day too. More than half are rotten from the damp. Snakes in tomatoes (eating mice who are eating tomatoes). Yikes, we need some pruning! Okra – picking daily small amounts. Late crop blooming (another 100 feet). Tomato – staking failure. Much of crop on the ground. Peppers – Stunning crop. Picked 4 times. Tomatillos – wormy, getting very few quality fruit. They need more space and are jammed in between Okra and Melons. The newest pile is very hot. Turn it. Earth work: add soil in low areas in perimeter. Thanks Vicki, I will keep posting. Ice covers the old elm right now and the garden. Would make a pretty pic.